I just looked at my desktop weather application and it says it's 12 degrees here in Delaware. Luckily, I am headed up north to NYC this weekend, where it's even colder. I have my camera charged and packed, ready to document this weekend. I can't wait to share it all with you on Monday. 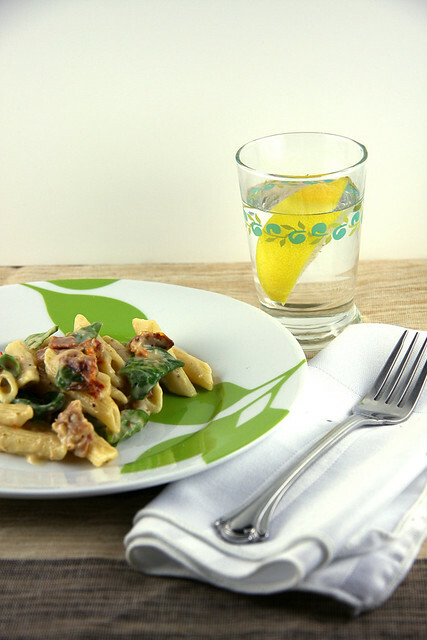 Today I am sharing a recipe I came up with because I had leftover prosciutto in the fridge and an old jar of sun dried tomatoes in the pantry. But don't worry, it wasn't too old, plus it was packed in oil so it's preserved. Right? 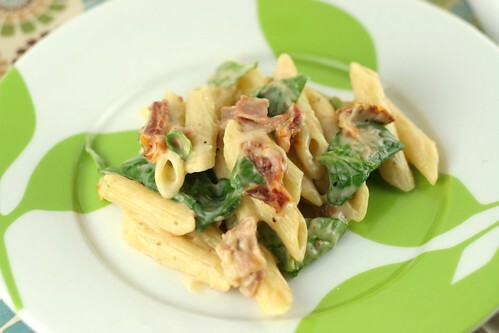 Turns out the cream sauce was delicious - flavors of garlic, prosciutto and sun dried tomatoes. It doesn't get more Italian than that. Right, Joanne? 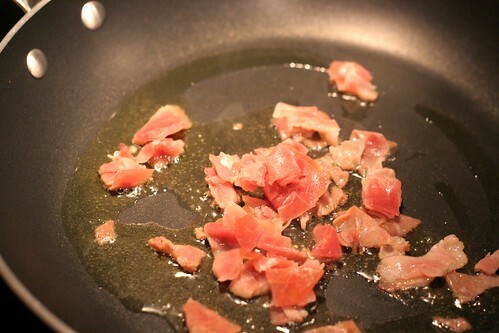 Start by chopping up 2 ounces of prosciutto, about 3 slices. Saute in a pan with some olive oil. 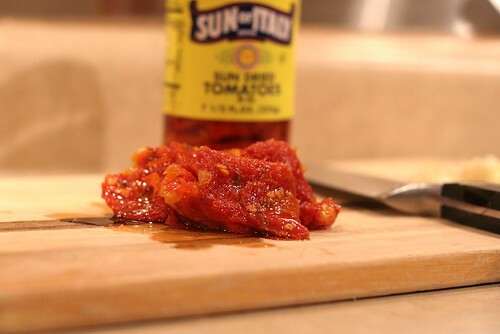 Get about 4 sun dried tomatoes, or about 2 tablespoons chopped. Make sure you buy a jar of tomatoes that are packed in oil. If they are dried, you have to soak them in boiling water until they reconstitute. It's much easier just to use these. Throw in minced garlic and cook this mixture for a few minutes, until everything cooks through and your whole kitchen smells like a 5 star Italian restaurant. Or at least that's what I tell myself. By the way, don't forget to cook the pasta. That's kind of important. I made a simple white sauce. The best way I have found to do this, is to use equal parts fat to flour. I melted 3 tablespoons of butter in a saucepan then added 3 tablespoons flour. Whisk it together until it forms a paste. After that cooks for a few minutes, add 2 cups of milk. As you whisk away over medium heat, this will form into a yummy, thick white sauce. You can flavor it with anything you like. Classic is salt, pepper and a bit of nutmeg. I added some Parmesan cheese to keep this legit. Add all those yummy bits from the skillet into the cream sauce. Then add pasta. Then add a handful of spinach leaves. It adds such a nice color and texture to this. 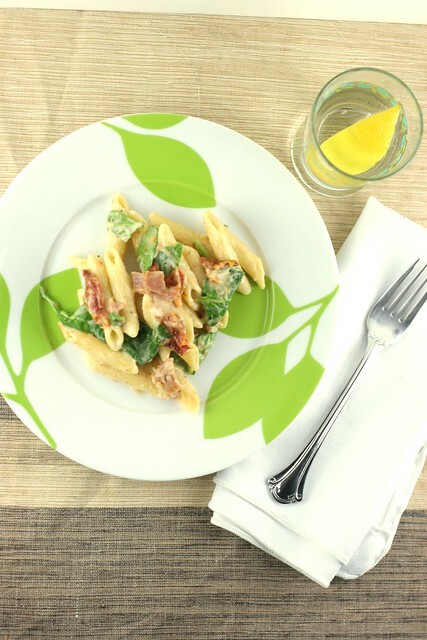 I love throwing greens into a pasta dish. The spinach will wilt as everything mixes together. This dish is a great way to impress without slaving over a pot for hours. It's really easy to make this even with such complex flavors. I thought the prosciutto flavor was a little strong, so I wrote the recipe with less than what I used. I hope it is more balanced now. Michael loved it though. He ate a lot of it and was looking for leftovers to take for lunch the next day. This is the trial and error of cooking... trying things and seeing what works and what doesn't. I love it. By the way, I plan on eating cookies until my pants burst at the seams at Levain Bakery this weekend. 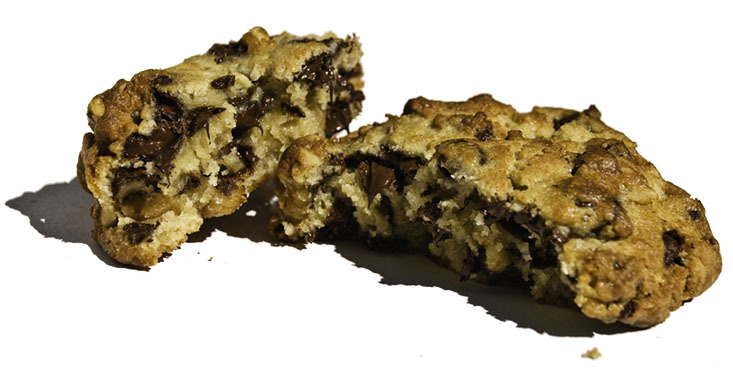 They serve ginormous, warm, melty cookies. I mean come on. I should just run away but I can't. I love New York. 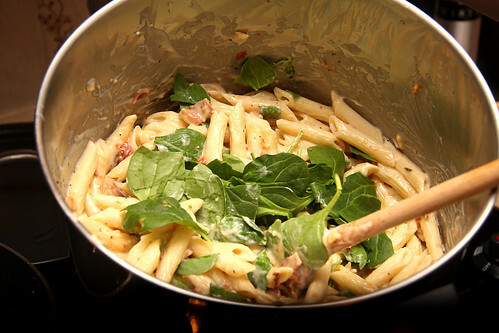 Boil pasta 10-12 minutes, drain and set aside. In a medium skillet, heat up olive oil for 2 minutes. 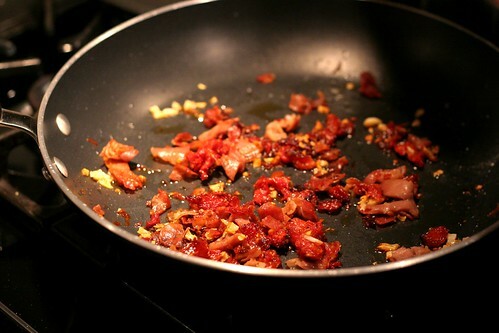 Chop prosciutto and sun dried tomatoes. Add to skillet. Mince garlic and add to skillet. Stir and cook for 4-5 minutes. Remove from heat and set aside. In a large saucepan over medium heat, melt butter. Add flour and whisk until a paste is formed. Whisk and cook paste for 1 minute. Lower heat to medium low and add milk. Whisk until sauce is thick, about 5 minutes. Remove from heat and add salt, pepper and Parmesan cheese. Add the tomato mixture from skillet. Combine everything and taste the sauce to make sure seasonings are right. Add pasta. Take spinach and tear with your hands as you add it to the pot. Combine everything, stirring until the spinach wilts. Serve immediately. the website doesn't do it justice but they carry great cheese and cured meats. you are going to love nyc! hehehe, so many good eats there. :) have you thought some more about the juicer??? :)!! It DEFINITELY does not get more italian than this. These are two of my FAVORITE mediterranean/Italian ingredients. In fact, I could just wrap the sun-dried tomatoes in prosciutto and be pretty content. Although pasta and cream sauce do make everything better. Great dish! Have fun in NYC! It is definitely cold here! There is some cutting back of calories when I get back home, for sure! Enjoy NYC & your cookies! You're in luck...NYC's gonna be in the toasty 40's this wknd! ;) Also, make sure to stop at City Bakery for a cup of their hot cocoa...not too thick, not too thin, with a homemade marshmallow. SOOOOOo rich and good! Great tips everyone!! I will definitely try City Bakery. I can never turn down hot chocolate. wow i'm late this time, but anyways there is a bakery called the Bouchon Bakery and it is at Columbus Circle, but anyways they have the BEST tomato soup and grilled cheese and the cookies are fab darling, just FAB. 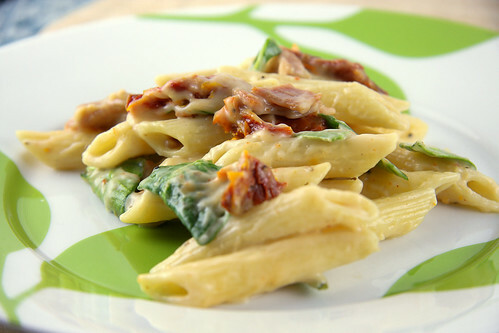 Your penne looks divine!!!! Ah Levain Bakery. Sooo far from Phoenix. Boo!! !